As we approach the launch date of the new Samsung Galaxy Tab tablet PC, it looks like we could soon be seeing a cheaper, Wi-Fi only version of the new slate. A cheaper Samsung slate on the, err, slate, is clearly good news for those of us that were considering buying Sammy's iPad-alternative, but don't really want to shell out for a costly 3G contract. The FCC page details the Samsung Galaxy Tab GT-P1010. No further official details on the pricing of the machine has yet been issued by Samsung. 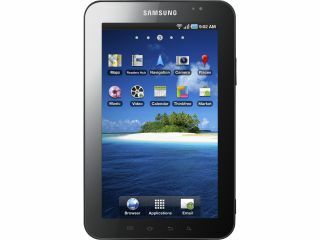 Samsung's WiFi-only Galaxy Tab GT-P1010 will run Anroid Froyo, just like its 3G big brother. US pricing for the 3G version is rumoured to be $499.99. Again, this is still to be confirmed by Samsung. The Galaxy Tab listed on the FCC page under the model number GT-P1010 has also been certified by Bluetooth SIG.